Getting up for our 6am departure from Flores was the easy part of our day when we travelled to Lanquin. The van was so full that any extra person would have had to sit on someone else’s knee as Tom was already sitting on a broken seat. The air-conditioning was only in the form of open windows and the seats all had low backs so nowhere to rest our heads for a nap. At least it was cheap (for us at least, some of the other passengers paid more than double our price). The drive was quite scenic as we travelled south through the centre of Guatemala through forests, up mountains and along valleys passing through very few settlements. After a few hours of driving the shuttle driver pulled up on the banks of a river and turned the engine off. We had no idea where we were but were told that we would be crossing the river after a short wait. Hopping out to stretch our legs we investigated the scene: a muddy looking river with vehicles queuing up on both sides and a strange looking car ferry doing laps across. This would be a new experience. Eventually it was our turn and we drove onto the boat and laughed at the operators moving between two outboard motors which were steering and powering us across the river. Tom tells me that the motors were quite small to be doing this, especially with 6 to 10 cars on board. Once this was accomplished we continued on our way stopping in Coban, which is the largest city we would be passing through. We were all recommended to withdraw cash here as Lanquin is tiny and has no facilities for this. As we were all non-Latin American tourists we were dropped at the McDonald’s for lunch before the van driver took off. A few people were quite concerned at this but we figured he was just off to find a cheaper local lunch or fill up with petrol during our break. Soon we were back in the uncomfortable van and on the last leg of our trip. On the map it didn’t seem like far but the roads eventually turned into dirt and the landscape was mountainous. We all spent this time staring out the windows as the view was beautiful. After a relatively quick 6 day trip through Belize it was time to pack up and head back to Guatemala. If you’ve been following our blog then you will know that we had previously visited both San Pedro la Laguna and Xela in Guatemala about five months prior. So that morning after meeting our friends, a British couple, the four of us hopped into a taxi which would take us from San Ignacio to the border and onwards to see some more of beautiful Guatemala. The border crossing was easy and after we had our passports stamped we bartered with some money changers before exchanging the remainder of our Belize dollars into Quetzales. The next step was to find transport to Flores. The ever so helpful taxi drivers told us the only way was by taxi, typical. We were pretty doubtful about this and walked off in search for a bus. As per usual the taxi drivers started drastically lowering their prices the further we got from them. A helpful kid (probably after a tip) asked us what we were looking for and showed us where the colectivos were located. As we thought there were plenty of options and they were much cheaper. Tom was relishing the chance to start speaking Spanish again and I think our friends found that useful as they hadn’t been to Spanish classes yet. So with a very unstressful border crossing behind us we were on our way to Flores. Once we arrived back in Belize City from our rainy and overcast few days on Caye Caulker we set off straight back to the bus station to continue our travels inland to San Ignacio. All we really knew about San Ignacio was that it was near a few archaeological sites and had some adventure style tourism available. With prices what they were in Belize we would have to evaluate what we could afford to do. The bus departed without much of a wait and we were soon on our way. It was an OK quality school style bus that flew along the road to the soundtrack of Caribbean dance and pop music pumping out the speakers. 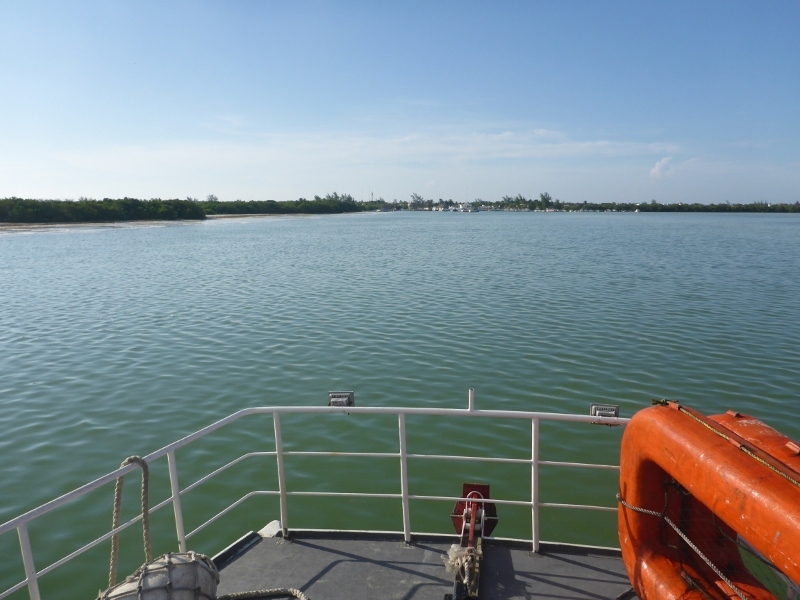 It was with nervous excitement that we left our hotel in Chetumal, Mexico and headed to the port. 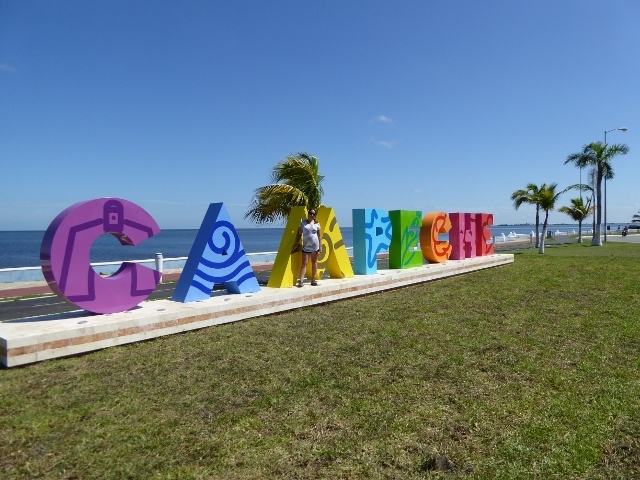 We decided that we would try get to Caye Caulker by ferry (via Ambergris Caye where immigration occurs), but once we reached the port that plan was definitely up for debate. The cost of the ferry we discovered was over 1000 Peso, making a few hours on a boat very expensive. So we flagged down a taxi and headed for option two: the bus. I know, I know, the title is a little tricky but let me tell you about our short two night adventure to Xpujil and Calakmul. To start with I’ll help with the pronunciation of Xpujil; it’s said Ish-poo-hill. So now as you read along you hopefully won’t struggle too much with this one. But there are other places we visited with just as fun names. If you run into trouble with them or want more information just remember; Wikipedia is your friend. We left Tulum bright and early and headed to the bus station where we boarded a bus to Chetumal. After using our lazy time in Tulum we were still actually undecided as to our next destination: would we stick around in Chetumal or would we mission to Xpujil? 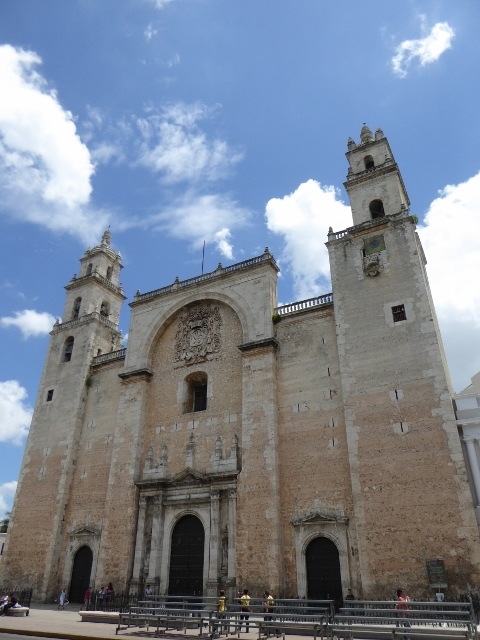 The issue was that Tom had lost his wallet with his driver’s license in Merida and driving was the easiest and cheapest way to get inland to the places we wanted to visit. They weren’t really on the usual tourist trail to say the least. Again another delay on blogging but I’m happy to say that Tom and I are back in the (currently) sunny South Island of New Zealand. We have had a busy month of travelling around to see family so have still been on the road living out of backpacks. The backpacks have grown a little with rediscovering clothes left at our parents houses as well as Christmas presents so a suitcase has been added to transport these. At the moment we are in Queenstown recovering from Christmas and New Year (Merry Christmas and Happy New Year to everyone reading this) so expect some quick posts about what we were up to between Mexico and our return home. After leaving Isla Holbox where we swum with whale sharks we opted to skip both Cancun and Playa del Carmen we jumped straight onto a bus to Tulum. In short we unfortunately found Tulum to be both underwhelming and overpriced, although we did stay for a week and saw a few cool places. The first hurdle we encountered was finding accommodation. We hunted through the whole town in the dark and still ended up in what we considered an overpriced budget hotel. The hotel manager gave us a bit of a run-around after we asked for a discounted weekly rate, which they granted, but then started removing perks such as the free bike hire and kitchen use. We thought this was a little unfair and got a bit cranky. As we were about to leave and find somewhere else to stay they re-allowed the inclusions. So overall Tulum didn’t start out great and continued to be expensive. Because of this we didn’t opt to take any tours over the week but still visited some interesting places. Leaving Valladolid we took a bus with our new friends to a random intersection on the road between Valladolid and Cancun. The only thing there was a tienda, a taxi stand and a bus assistant to assure us that there was another bus on it’s way to take us to onwards to the island. So the five of us camped out in the shade of the tienda to wait for an hour or so. The bus finally arrived and we were on our way to the ferry terminal to get to Isla Holbox. 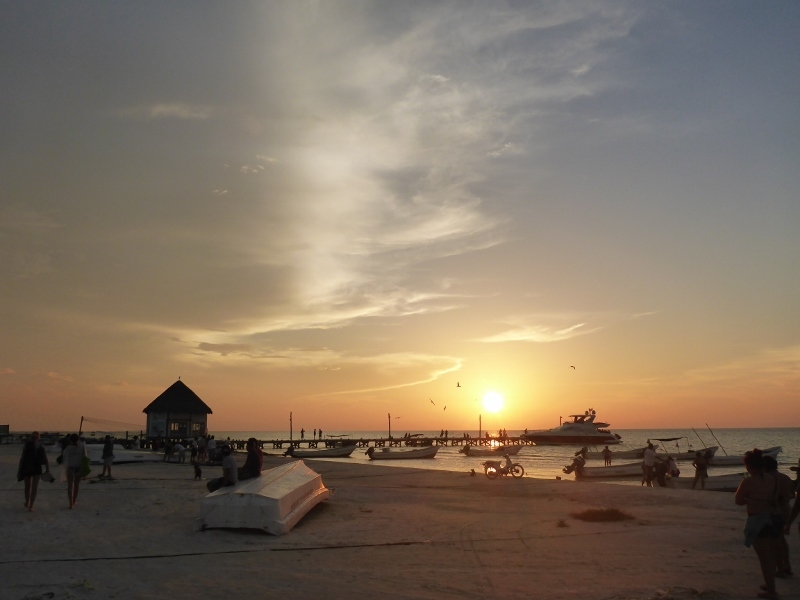 Holbox (pronounced Hol-bosh) is a small island off the northern coast of the Yucatan. It has sand streets so golf carts are the main type of transportation, and a lot of mosquitos. Surprisingly we had actually made a booking for a place to stay so we had no stress as we made our way there to be welcomed (or not) by a rude, unhelpful and unfriendly staff member. Luckily his morning counterpart was the opposite; cheerful and friendly. After settling in we went for a walk to get to know the town and get dinner. That evening we ate fish at a restaurant on the beach with the sand between our toes while we watched the sun set. But food and drinks don’t come cheap on Holbox so for the remainder of our stay we cooked for ourselves. Hi everyone, sorry for the huge break between posts. The reason is that we have booked flights home to spend Christmas with our lovely families so we have a lot to see in a short space of time. Since leaving Valladolid we have seen so many new places and travelled through the remainder of Mexico, Belize, Guatemala, El Salvador and Honduras so we have been super busy with our upcoming deadline. Don’t worry the posts will continue when we have time which I guess will be once we have returned to New Zealand. So stay tuned for all of our exciting adventures in Central America! After an eventful stay in Merida involving lost wallets and police on the negative side and caves and ruins on the positive we took off via second class bus for Valladolid. To tell the truth we didn’t really know much about Valladolid except for the fact that it’s close to Chichen Itza. We arrived and did our usual search for accommodation. The first stop involved visiting a hostel we had heard good things about. They didn’t have a cheap private room available so we crossed the road and stayed at a new hostel, which was more like a guesthouse, but cheap nonetheless. As it had a kitchen we headed off on a mission to a small grocery store to get some dinner supplies. Over our five night stay here the girl at the deli counter at this supermarket got to know us which shows how often we cooked. We filled up our days here with activities so the days went by quite quickly with relaxation and beers being our only evening plans. What was lost in Merida? The trip from Campeche wasn’t supposed to be long but it was hot in the bus and although we had booked and paid for a direct bus this one decided to stop in all the small towns along the way. The bus station in Merida is relatively central so we set off with our packs to locate a hotel or hostel. 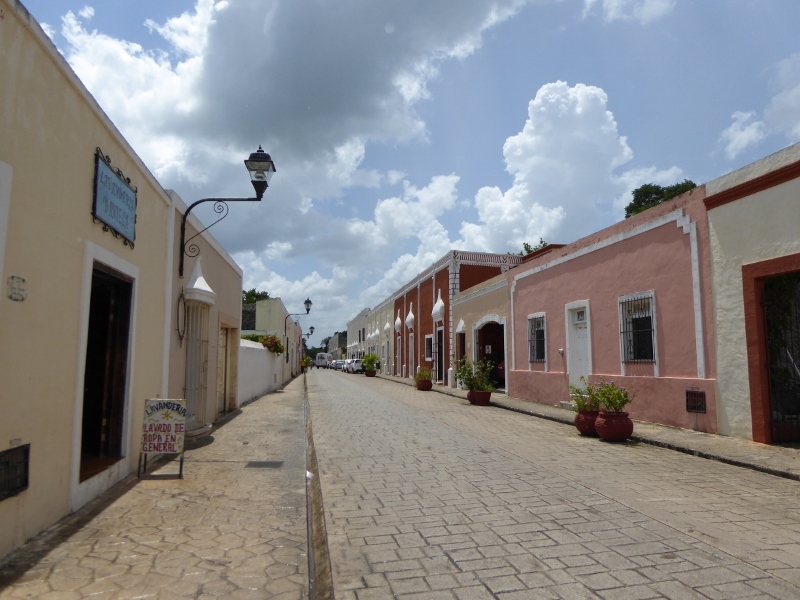 As we were in the Yucatan we now had proper hostels to choose from along with the usual budget hotel options. Along route to the zocalo we stopped in to see a hostel who’s rooms looked average to say the least (but certainly not the worst we have seen now). The next hotel we stopped at was cheap and after checking the room out we decided to stay. This hotel was 250 peso per night and was a half block from the zocalo. We aren’t sure why it was so cheap, but hey no complaints. Upstairs in the hotel was a restaurant and we ate there a LOT. It was a great price for tasty food, which had a lot of vegetables for Mexican food, and cheap beers (Tom will always check the beer price on a menu to ‘judge’ the price of a restaurant). 5 am wasn’t the nicest time to be arriving into a new place but as we were a little disorganised it wasn’t a completely bad thing. 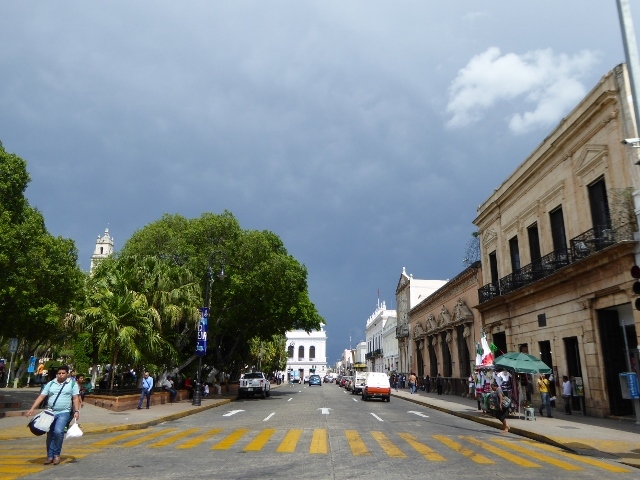 We had travelled from Palenque to Villahermosa and quickly decided that it wasn’t going to be the nicest place to spend a few days so we jumped back onto an overnight bus to Campeche. So there we were, in town before a lot of things opened, well before the sun was up. Given the amount of day we had in front of us you would think that finding accommodation would be easy. Not so. A lot of the hotels were over our budget here and the ones which weren’t were unsure if they had private rooms available until midday when guests were due to check-out. So we detoured to eat breakfast at the only food place we could find. After re-energising with an eggy breakfast we found a hotel which looked good and were able to leave our packs at reception.